Whether you got your Instant Pot as a gift or bought one for yourself, you know how amazing this little machine can be. If you haven’t bought one yet, use the questions below to determine which size will be best for your family. If you’ve asked your friends which Instant Pot they have, chances are their answers are split down the middle between the 6 quart and 8 quart, depending on their family size. Did you know there are different models, too? The Lux Model comes in 5 or 6 quart. It is the most basic model and it does not have the yogurt function, which is one we use often. The Duo Model is probably the most popular. It comes in 5, 6, and 8 quart options. The Duo has all of the basic features plus the yogurt function, and the ability to choose low or high pressure (whereas the Lux only has high pressure). The Smart Model is exactly what it sounds like! It has Bluetooth functionality and comes in the 6 quart size. Newer models include the Instant Pot Ultra and the Duo Plus. If you have a large family, I suggest the 8 quart Duo. If you have 4 (or fewer) members in your family, the 6 quart Duo should serve you well. Still have questions? 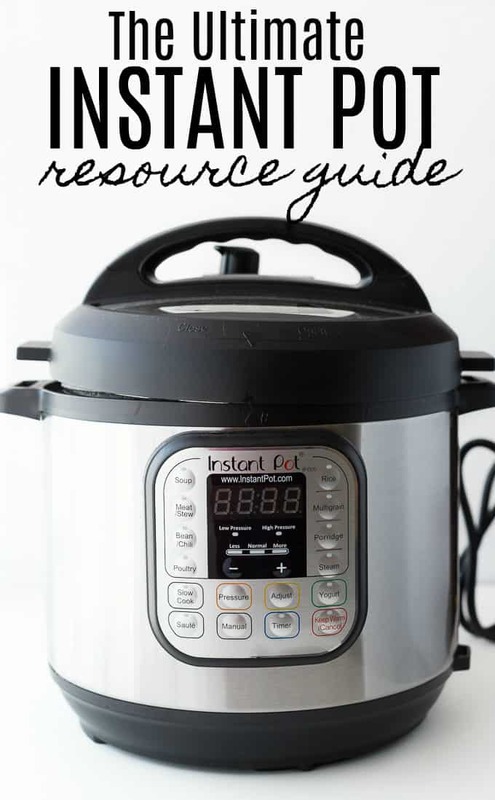 Check out the Instant Pot Buyer’s Guide. Keeping your Instant Pot clean is important, and it’s not that difficult to do. This little scrub set will help you get the job done. This yogurt maker makes life so easy when you’re making a batch of yogurt for the kids each week! Your Instant Pot will get hot, hot, hot! My two favourite tools for removing the pan are these tongs and mini mitts. I’m a huge fan of slow cooking in the Instant Pot. Use this lid if you’d like to try it, too! Use a mesh basket to steam veggies and cook pasta. You’ll want this springform pan so you can make an amazing cheesecake! One of the first things you’ll likely make in your Instant Pot will be hardboiled eggs. Use these trivets for perfect eggs! Using the manual button: If a recipe says to cook at high pressure for 12 minutes, set the Instant Pot to manual and set the timer to 12 minutes. When to use “quick release” vs “natural release”: Use the QR to prevent overcooking of vegetables and other foods that are easily overcooked, like seafood. NR is better for soups and other recipes with large amounts of liquid, as it lets the pressure out gradually. Use the saute function to brown meat. I got this tip from an Instant Pot page and it’s been really helpful for converting recipes. The Instant Pot operates at 11.6 psi, while other pressure cookers operate at 15 psi. That means you’ll need to cook a few extra minutes when using the Instant Pot. Your Instant Pot needs time to warm up, or pressurize, so it’s important to realize that the cook time on the recipe is not the amount of time it will take. For example, if you’re cooking poultry and it says to cook for 15 minutes, your total time might be 25 minutes because of the time it takes to get ready to cook. You can convert slow cooker recipes to use in your Instant Pot! This is a game changer, for sure. There are tons of Instant Pot recipes on the web. Especially if you look on Pinterest, you’re going to have so many ideas! Feeling adventurous? Put together your own Instant Pot meal plan using some of the recipes below. If you are a freezer meal person, try these 50 Instant Pot freezer meals. Instant Pot Yogurt with fruit makes an easy weekday breakfast. Make a bunch ahead of time and use these adorable mini mason jars to store them in the fridge. I’m loving how simple this Instant Pot Egg Bake is. You could add pretty much any vegetables you wanted, as well as different seasonings. Green onions would be a nice touch. Frittatas are easy to make in individual servings, and I’m betting they would reheat well. The best Instant Pot macaroni and cheese is one that is creamy, cheesy, and easy to make. I think we’ve got all the bases covered with this recipe! The Instant Pot is versatile enough for all of your favorite recipes, like this Instant Pot Kung Pao Chicken. Really want to impress your family? Make them the best Instant Pot lasagna and they’ll be asking for more! If you’ve got a sweet tooth, you’ll want to make some Instant Pot desserts. Instant Pot Apple Crisp – good for any occasion. Instant Pot Strawberry Cobbler – the perfect summer dessert. Check out these Instant Pot gifts. Do you have any Instant Pot tips to share? I love my Instant Pot! I’ve bought at least 3 more as gifts for friends and family. 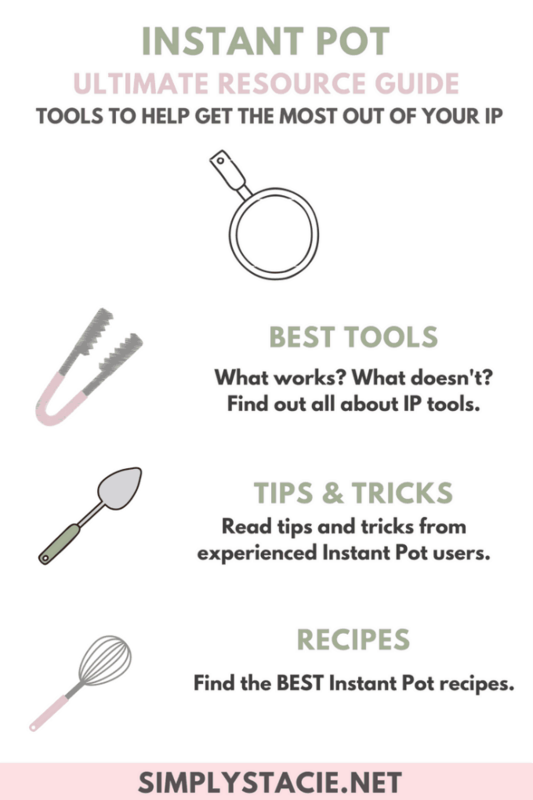 I’m bookmarking this page because it’s great for those who are new to the IP Life. I would give up all of my small kitchen appliances for this one! Thanks for the wonderful review i have been seriously thinking about buying one ! Instant Pot Tips seem to be the new rage. I’d love to experience one to see exactly how much better it is than my pressure cooker. Awesome thanks – we just picked one up!